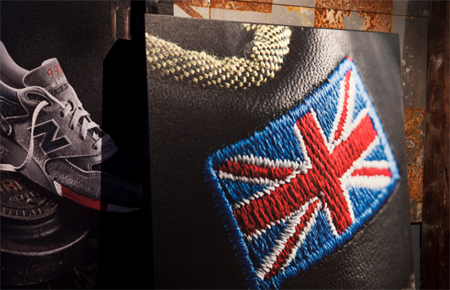 The sportswear brand took inspiration from a rich athletic heritage for its Olympics 2012 New Balance Experience Centre at London's Millbank Tower. Sportswear brand New Balance used to have its own in-house meetings and events planner in the UK, Lisa Pennington, but in 2007 it took the decision to outsource UK event operations to Pennington, who started up her own agency Definitive Events. Having delivered successful programmes for two consecutive Olympics - Athens 2004 and Beijing 2008 - Pennington was appointed without pitch to create a B2B brand experience and hospitality programme for New Balance at the London 2012 Games. New Balance sponsors 37 athletes from 15 countries and also launched the British Miler campaign in the run up to the Olympics. Planning for the programme started three years ago, and Definitive Events viewed 40 venues before deciding on Millbank Tower for The New Balance Experience Centre, and the Hilton hotel next door for guests travelling from overseas. New Balance global retail creative director Bob Neville says creating a programme around the Olympics enables the brand to bring together its key B2B customers such as retailers from around the world, give them a great experience and thank them. "We want them to know we appreciate them and their business and that they are an important part of the New Balance family," says Neville. He says the main difference this year is that the focus was more about the heritage of the brand rather than showcasing the products. New Balance started in 1906 and this year celebrates 30 years of footwear manufacturing in the UK at its factory in Flimby, Cumbria. Neville wanted to showcase this strong manufacturing heritage with a unique space. "People often don't realise we have been around as long as we have and it's my job to use these kind of events to tell the story," says Neville. New Balance personally invited key customers to the Games, people who were also likely to be receiving invites from other sportswear brands. New Balance converted the 28th floor of the Millbank Tower - a modern space - into an environment akin to an artist's loft/warehouse steeped in New Balance shoe-making heritage, with floors using reclaimed wood from a 40-year old Scottish gymnasium and walls created with bricks from century-old mills in Northern England. As Millbank Tower is an office building, Pennington and build-partner Octink were restricted when it came to setting up as they could not make noise during the hours of 9am to 5pm. Meanwhile, with sustainability a key focus for the Games, Neville was also keen to incorporate an element of this into the New Balance Experience Centre. "Feedback from the Beijing Games showed that when asked why they chose to attend as guests of New Balance rather than other brands, delegates said it was because the flexibility of the itinerary allowed them to do as much or as little as they wanted," says Pennington. A similar approach was taken when planning the London 2012 programme. Around 500 people from 30 countries around the world including day guests and 'plus ones' were invited to take part in the programme. UK delegates were mostly invited as day guests, while groups from Europe and further afield came for threeto five-night programmes depending on their destination. In addition to B2B customers, executives from across New Balance were invited and a competition was run at the Flimby factory, with winning staff invited down to enjoy the hospitality. When groups arrived at the New Balance Experience Centre, each person was given a welcome pack and pair of New Balance trainers, along with their Olympic tickets - tickets were pre-allocated based on information given by delegates on their event preferences. The New Balance Experience Centre was open from 9am to midnight every day and guests could come and go as they pleased, have a meal or drink and enjoy the views over London, with screens showing Olympics coverage throughout the day and into the evening. A branded boat was available to take groups up the River Thames to the Olympic Park each day. There was no set itinerary, but tickets were available for The London Eye - New Balance had booked out capsules - a London Bus Tour and a London Pass, which was valid for three days and provided access to more than 50 attractions. Pennington says Octink was a great partner and handled the build quickly and efficiently, despite having to shift tonnes of sand and bricks in a lift to the 28th floor outside working hours to transform the space. New Balance partnered with several groups of London's Kingston University School of Art students to "upcycle" manufacturing scrap materials from the company's Flimby shoe factory to create original pieces of furniture, including sofas, chairs, end tables and artwork pieces, for the centre. The brand also partnered with The Cottage Project, a community-based arts project based in South London, which ran a Pop Up Makers Space at the centre to give visitors a chance to observe, learn and participate in British making such as weaving, ceramics and upholstery, using materials from the Flimby factory. As part of its aim to reduce waste from the UK factory by ten per cent next year, Neville says the company has extended this relationship and will supply waste materials to the artists at The Cottage Project to use to make products to sell. "It's great that when we've gone after the Games, there will be a legacy that remains," says Neville. The plan was to reuse materials from the build, but the venue has now decided to keep it in place as a temporary pop-up space. Meanwhile, the student-designed chairs will be used in New Balance's headquarters and other offices. "The New Balance Experience Centre brings the brand to life in multiple dimensions and speaks to who we are as a brand, our history and our values," says New Balance president and CEO Rob DeMartini. As C&IT went to press, New Balance had just completed its Olympic programme so it was too early for a detailed post-event analysis. Definitive Events will conduct a follow-up evaluation survey with delegates, but Neville says: "We've already had lots of positive comments from our guests and staff who love the space we created."